Back in June this year we took a look at the first i9 CPU model with the launch of the i9 7900X. Intel has since followed on from that with the rest of the i9 chips receiving a paper launch back in late August and with the promise of those CPU’s making it into the publics hands shortly afterward. Since then we’ve seen the first stock start to arrive with us here in Scan and we’ve now had a chance to sit down and test the first of this extended i9 range in the shape of the i9 7920X. The CPU itself is 12 cores along with hyper-threading, offering us a total of 24 logical cores to play with. The base clock of the chip is 2.9GHz and a max turbo frequency of 4.30GHz with a reported 140W TDP which is much in line with the rest of the chips below it in the enthusiast range. Running at that base clock speed the chip is 400MHz slower per core than the 10 core edition 7900X. So if you add up all the available cores running at those clock speeds (12 X 2900 vs 10 X 3300) and compare the two chips on paper, then the looks to be less than 2GHz total available overhead separating them but still in the 7920X’s favor. So looking at it that way, why would you pay the premium £200 for the 12 core? Well interestingly both CPU’s claim to be able to turbo to the same max clock rating of 4.3GHz, although it should be noted that turbo is designed to factor in power usage and heat generation too, so if your cooling isn’t up to the job then you shouldn’t expect it to be hitting such heady heights constantly and whilst I’m concerned that I may be sounding like a broken record by this point, as with all the high-end CPU releases this year you should be taking care with your cooling selection in order to ensure you get the maximum amount of performance from your chip. Of course, the last thing we want to see is the power states throttling the chip in use and hampering our testing, so as always we’ve ensured decent cooling but aimed to keep the noise levels reasonable where we can. Normally we’d look to tweak it up to max turbo and lock it off, whilst keeping those temperatures in check and ensuring the system will be able to deliver a constant performance return for your needs. However, in this case, I’ve not taken it quite all the way to the turbo max, choosing to keep it held back slightly at 4.2GHz across all cores. I was finding that the CPU would only ever bounce of 4.3GHz when left to work under its own optimized settings and on the sort of air cooling we tend to favour it wouldn’t quite maintain the 4.3GHz that was achieved with the 7900X in the last round of testing without occasionally throttling back. It will, however, do it on an AIO water loop cooler, although you’re adding another higher speed fan in that scenario and I didn’t feel the tradeoff was worth it personally, but certainly worth considering for anyone lucky to have a separate machine and control room where a bit more noise would go unnoticed. Just as a note at this point, if you run it at stock and let it work its own turbo settings then you can expect an idle temperature around 40 degrees and under heavy load it still should be keeping it under 80 degrees on average which is acceptable and certainly better than we suspected around the time of the 7900X launch. 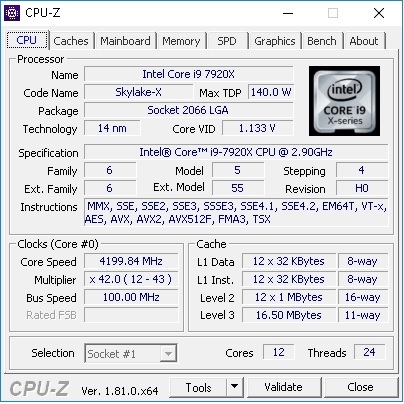 However, I was seeing the P-states raising and dropping the core clock speeds in order to keep its power usage down and upon running Geekbench and comparing the results that my 4.2GHz on all cores setting gave us an additional 2000 points (around 7% increase) over the turbo to 4.3GHz default setting found in the stock configuration. My own temps idled in the 40’s and maxed around 85 degrees whilst running the torture tests for an afternoon, so for a few degrees more you can ensure that you get more constant performance from the setup. 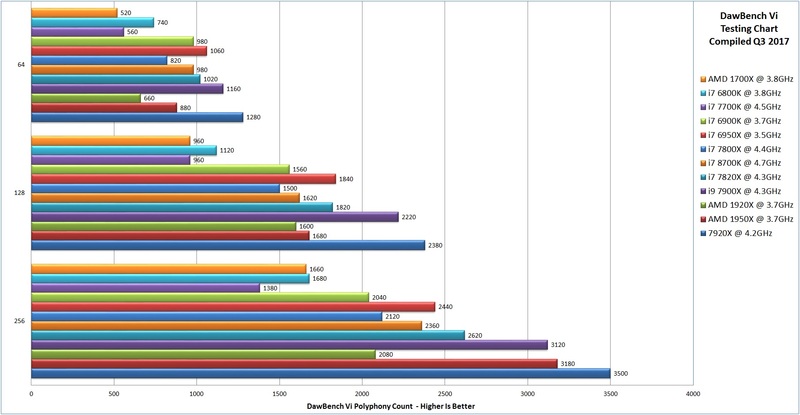 Also worth noting is that we’ve had our CAD workstations up to around 4.5GHz and higher in a number of instances although in those instances we’re talking about a full water loop and a number of extra fans to maintain stability under that sort of workload, which wouldn’t be ideal for users working in close proximity to a highly sensitive mic. Ok, so first up the CPUz information for the chip at hand, as well it’s Geelbench results. 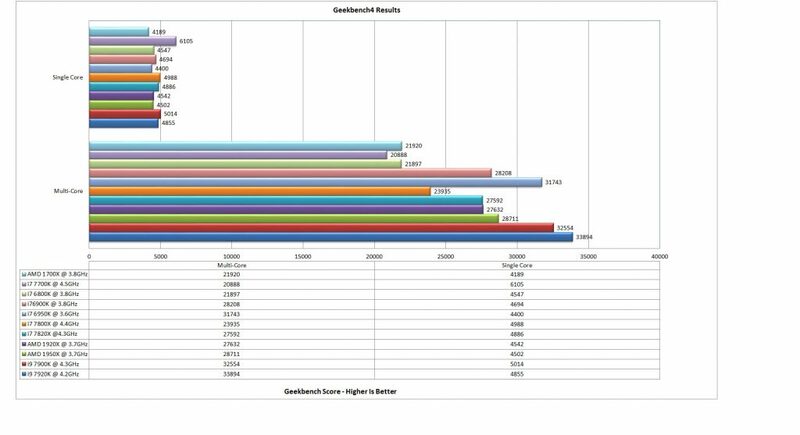 More importantly for this comparison is the Geekbench 4 results and to be frank it’s all pretty much where we’d expect it to be in this one. 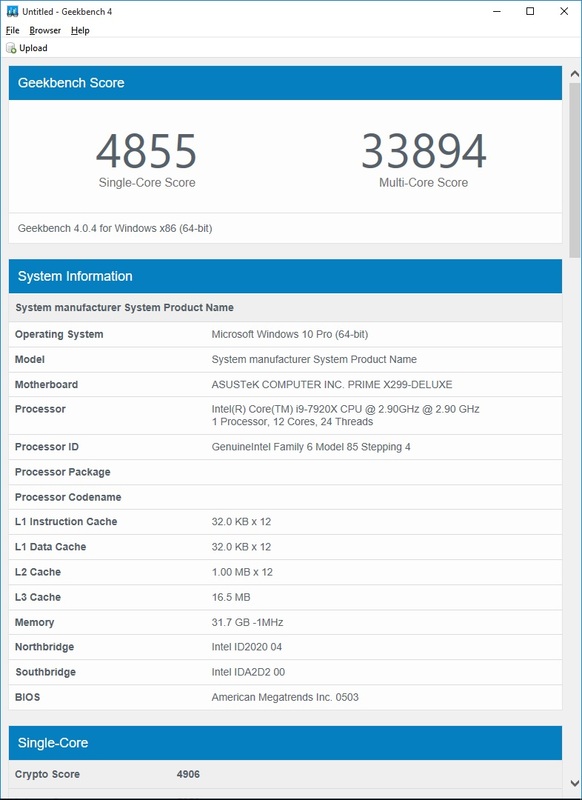 The single core score is down compared with the 7900X, but we’d expect this given the 4.2GHz clocking of the chip against the 4.3GHz 7900X. 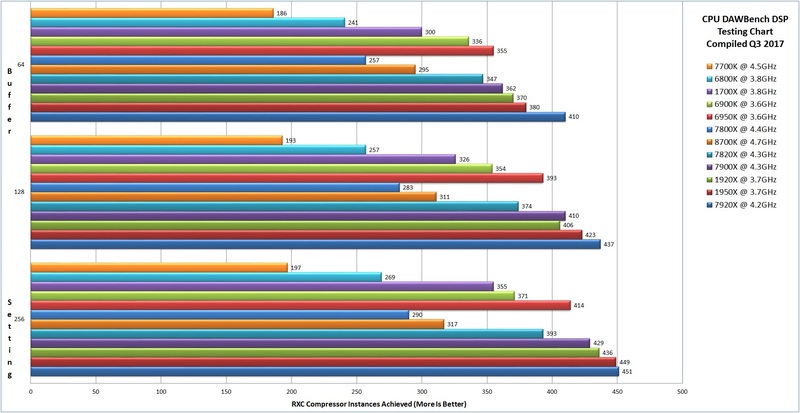 The multicore score is similarly up, but then we have a few more cores so all in all pretty much as expected here. On with the DAWBench tests and again, no real surprises here. 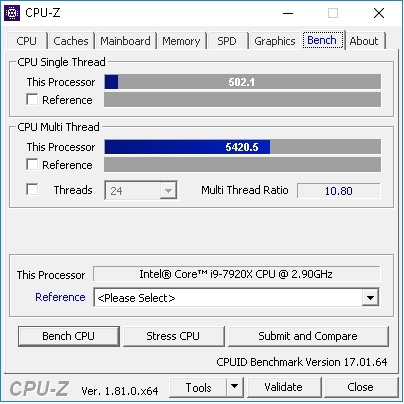 I’d peg it at being around an average of 10% or so increase over the 7900X which given we’re just stacking more cores on the same chip design really shouldn’t surprise us at all. It’s a solid solution and certainly the highest benching we’ve seen so far barring the models due to land above it. 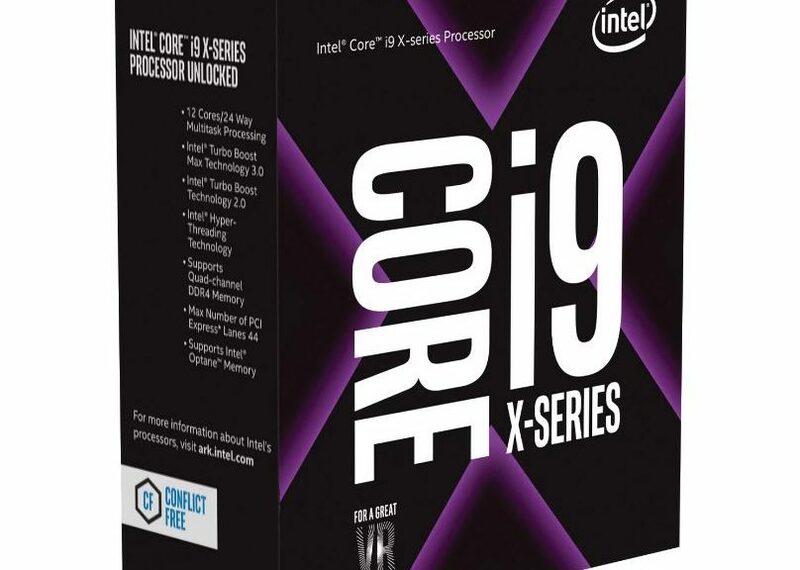 Bang per buck it’s £1020 price tag when compared to the £900 for the 10 core edition it seems to perform well on the Intel price curve and it looks like the wider market situation has curbed some of the price points we might have otherwise seen these chips hit. And that’s the crux of it right now. Depending on your application and needs the are solutions from both sides that might fit you well. I’m not going to delve too far into discussing the value of the offerings that are currently available as prices do seem to be in flux to some degree with this generation. Initially, when it was listed we were discussing an estimated price of £100 per core and now we seem to be around £90 per core at the time of writing which seems to be a positive result for anyone wishing to pick one up. Of course, the benchmarks should always be kept in mind along with that current pricing and it remains great to see continued healthy competition and I suspect with the further chips still to come this year, we may still see some additional movement before the market truly starts to settle after what really has been a release packed 12 months. Previous PostThe Wampler ‘Ethereal’ and other CathedralsNext PostFirst Look At The Intel 8700K As The i7 Range Gets A Caffeine Injection.